Julian Niccolini and Alex von Bidder, the partners famous for inventing the Manhattan “power lunch,” will open their highly-anticipated The Four Seasons restaurant in a new location on East 49th Street this Wednesday. 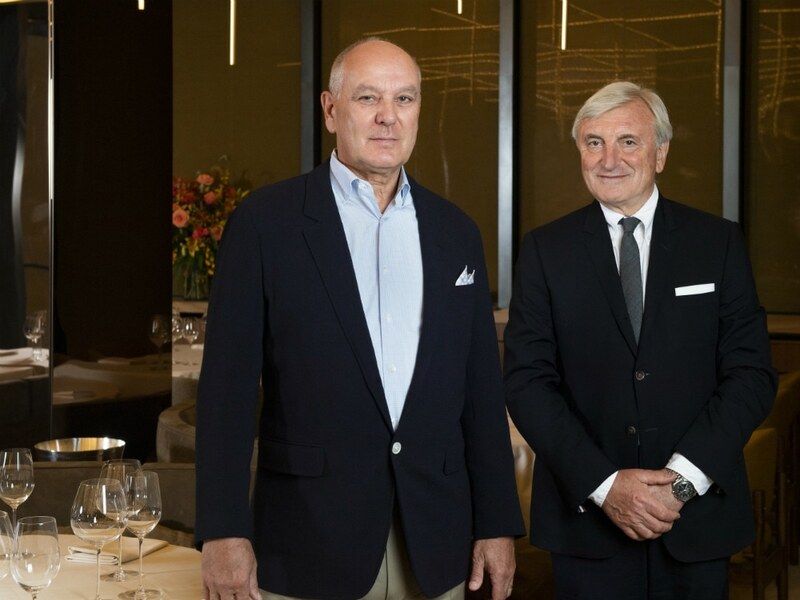 The Four Seasons owners Alex von Bidder and Julian Niccolini reopen their iconic restaurant this week. The latest incarnation of the restaurant, designed by world-renowned Brazilian architect Isay Weinfed, features a top-notch team of chefs including executive chef Diego Garcia, formerly of Gloria, a seafood restaurant in Hell’s Kitchen, and Le Bernardin, and chef de cuisine Brandon Lajes, also of Le Bernardin, as well as executive pastry chef Bill Yosses, the prominent former White House pastry chef and owner of Perfect Pie. The glamourous two-story space has a spectacular sunken gold leaf-wrapped grand bar room surrounded by designer chairs from Edward Wormly. A long runway—reminisent of a catwalk—separates the bar from the dining room with added panache. Perhaps, the cornerstone of the room is the large light installation from designer Michael Anastassiades that stretches across the ceiling. Crowd pleasers such as the restaurant's signature roast farmhouse duck with cherry sauce, Maryland crabmeat cakes, dover sole meunière, and steak tartare are back on the menu. But new items, including a fluke crudo with watermelon radish and seaweed vinaigrette, grilled langostine with wakame butter, and butter-poached lobster with potato puree and chorizo sauce, are set to highlight Garcia's background in seafood. 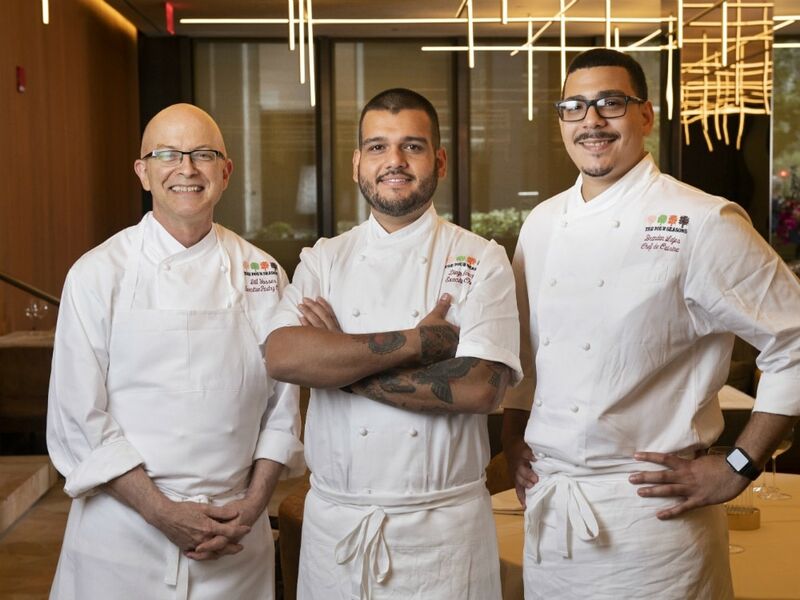 Pastry chef Bill Yosses joins executive chef Diego Garcia and chef de cuisine Brandon Lajes in the kitchen at the new Four Seasons. For dessert, Yosses has taken on several classics including a chocolate cake Napolean and classic soufflé with blueberries and dark chocolate. The restaurant's famed cotton candy tower is also back. New additions to the pastry menu feature spiced ice cream pavlova with tangerine sorbet and almond, panna cotta with caramelized figs, orange sauvignon blanc granita, and pistacio puff with organic strawberries and apricot sorbet. Mark Drew, known for developing libations for Milk and Honey and Robuchon, created the cocktail menu with a modern spin on classics. Drew and Niccolini collaborated on the extensive wine list of over 1,000 selections from top producers around the world.